Coach Turnage introduces new Head Girls Basketball and Assistant Softball Coach, Shaunda Bedel. 2018 Summer Camps Have Been Posted! Check your calendars and submit your online registration forms! 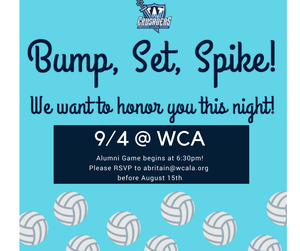 The camps are not just for WCA students! Our camps are for all students in our communities! Westminster Christian Academy’s Head of School Mr. Scott Davis is pleased to announce the appointment of Coach Robert "Buddy" Turnage as the school’s new Athletic Director. In the second game of the John Bradley Memorial-Kiwanis Club Jamboree played Friday night at Westminster Academy Crusaders’ Stadium, the WCA Crusaders shined bright on the field. The Crusaders’ rushing game produced 137 of the team’s 148 total offensive yards. Fournet gained a team-leading 51 on 11 carries. Mark Thomas gained another 43. Thomas also had four solo tackles behind team leader Brock Bullara, with eight. Myles Dixon tackled five ball carriers. The Crusader mascot has long been associated with Westminster Christian Academy. In fact, if you walk into the gym in Opelousas, you can't miss the large images on the far wall. These images have been utilized by Westminster for a long time and will forever be part of our identity and history.